For @nessalouise's final topic she chose comic book characters and there have been a lot of suggestions today. But after a campaign of some magnitude waged on facebook by one individual there really was no choice. So as much as I'd have loved to have written about Mr Wayne I'm gonna write about Mr Parker instead. So with a slightly new look and the 'read more' button here's tonight's icon post. imagination has captured generations of kids and adults alike. So why is Spiderman so popular? What makes him stand out from the Superhero crowd? Well there's two things that spring to mind about the character to be honest. The first is Peter Parker. Spiderman's secret identity is a bit of a high school loser, terrible with girls and he lives with an elderly aunt. He was designed to appeal to your average comic book geek. He was clever though, he went and invented a web shooting device that fired spider webs from his wrists allowing him to swing from building to building. (The whole biological web thing that you see in the films came later in the comics but was later ditched again in favour of mechanical web shooters. No I'm not making this up.) The second reason he's so popular is that even as Spiderman there's still this fallibleness to the character. Peter Parker/Spiderman always feel like one and the same. When Peter wears the mask he becomes Spiderman but remains Peter Parker. His confidence is higher but he still screws up, regularly. He's also reviled by the press (in the comic) and he works for the paper's owner, that hates him the most, as a part time photographer. It's all these clashes, in his life, that make the character more complex than your average hero and certainly more interesting than Superman. 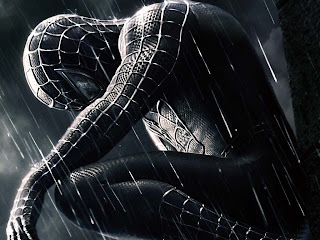 So why has Spiderman endured along with DC's holy trinity? A seemingly endless stream of great villains have helped for sure. Venom, in particular, was a genius idea from the late 1980's that was sadly under used and poorly executed in the last movie. Dr Octopus and the Green Goblin were more successfully translated to the big screen and the three films have certainly helped to keep Spiderman in the public's eye. However I'm pretty sure lots of people would have suggested him today without them. The costume is very cool too, although personally I loved the black suit and was actually disappointed when it turned out to be the alien symbiote Venom. Although when the alien turnes out to look this cool you can't really complain. Marvel haven't had as many iconic successes as DC but what they've been better at his humanising their heroes, where as DC have always focused on the other worldliness of theirs. The Iron Man movie was another great example of how well defined a character Stan Lee and co had created and for me, along with Wolverine, he runs Spiderman the closest for the most iconic. 50 years ago Stan Lee saw a spider climb up a wall and got inspired to dream up Spiderman, here's to another 50. Tonight's post is dedicated too @MrsR1ck, @theboycheese, @SoullsTheGoal, @twosoups (two weeks in a row for soups and included despite changing her mind with 25 minutes to go) and @SisterLedge. For everyone today that suggested Dennis the Menace I completely agree that he is iconic. But when I think comic book characters, I think superheroes.